The energy of the sun is yet to be fully captured and embraced by people and technology. However, more are starting to recognize the potential of solar energy. This is leading to growing numbers of solar panel installation and usage. More solar power companies are springing up around Singapore. This is triggered by government investments in creating innovation solar energy technologies to supply power. In a month, one solar panel has the ability to generate enough power to meet the needs of a five-room HDB flat. The sustainable nature and strength of these panels is to be explored by Singapore. Recently, solar panel tests took place on ponds and reservoirs at Bishan Park from March 2013 until December 2014. The tests included Southeast Asia’s first floating photovoltaic (PV) system in the Pond Gardens of Bishan Park. This system used 20 REC Peak Energy Series modules positioned on top of interlocked UV-resistant floating assembly. Each of the panels was arranged at a 10 degree angle. Phoenix Solar Singapore, a subsidiary of the Solar Energy Equipment provider, tested the system’s suitability, in conjunction with the fresh water. Phoenix Solar integrated multiple solar sensors to measure irradiation, temperature, and humidity. The data from the sensors provided measures of the systems performance and information for future research. This project was made possible through collaboration between Phoenix Solar and the National Parks Board. The solar modules were manufactured in Singapore and donated by REC Modules Pte Ltd. Together they worked to introduce the prospect of PV installation for land scarce regions. Another solar panel test is planned to be conducted at Tengeh Reservoir in late 2014. This site would reflect how the panels would be affected by saltwater environments. The Economic Development Board and national water agency PUB led the S$11 million endeavor. While the Solar Energy Research Institute of Singapore will manage it. Six companies are expected to implement 7 solar systems when the first phase is rolled out by 2016. In the second phase, two companies will move forward to work on systems to meet larger capacities. “With that living lab strategy, we want to avail piloting sites in Singapore to solar and energy management-related companies. (The) floating PV pilot therefore is one of our key piloting sites, where companies can hone their capabilities, and very importantly build their track records,” he added. 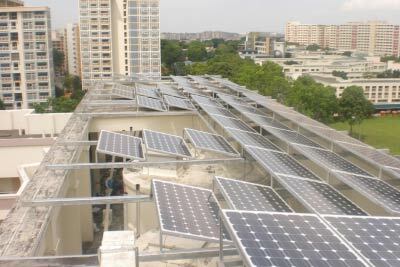 Since 2007, the number of solar panel companies operating in Singapore increased from 10 to 50. Singapore aims to raise adoption of solar power to 350 megawatt peak by the year 2020. With projects increasing the scope of megawatts year-by-year, the nation should reach this goal to provide 5 percent of peak electricity demand.